The above scripture does NOT say that ten existing nations will be the group that gives their power to the Beast, but ten kings who had not kingdom get power and transfer it. This, as leaders of the Kehilah of Yahwshua have written before (see Herman von Rompuy, the Greek Debt Crisis, and Where May this Lead? ), means that a political/structural shift is expected to happen in Europe. Hence while nations will be involved, this is more likely groups of nations, combinations of nations, or redrawn territorial borders. To teach that this means that there must be 10 nations as they currently exist in today's Europe, is in error. Europe: Strong Mixed With Weak Nations Will Unite . . . The Bible says the final "Empire" on Earth before Yahwshua returns will be a "re-united" Roman Empire of strong nations mixed with weak nations out of which the Anti-christ will rise . . . Europe! And as the toes and feet were partly of iron and partly of clay, so the (re-united) kingdom shall be partly strong and partly fragile . . ."
"Then I stood on the sand of the sea. And I saw a Beast (Satan’s Antichrist) rising up out of the sea, having seven heads and ten horns, and on his horns ten crowns, (other prophecies tell us these represent nations in Europe) and on his heads a blasphemous name . . .
"The ten horns are ten kings who shall arise from (out of) this kingdom (the Roman Empire ... now modern Europe). It is worth noting that the leaders of France, Italy, Germany, and England have called for the need to have a "powerful leader" lead and head the new and rising "European Union" ... this man would immediately possess, in a moment of time, the power over all of Europe that eluded Adolph Hitler (Germany), Kaiser Wilhelm (Germany), Napoleon Bonaparte (France), and the Royalties of England, Spain, and others to gain and restore the dominion and power of the ancient Roman Empire . . .
Why? Yhwh is warning us . . . The Kingdom of Heaven is available to every man, woman, boy, and girl in this world. It is freely offered to any and all who will receive it. Simply learn of Yahwshua, invite Him into your life as your Sovereign Master, believe He died on the Cross for all of your sins and rose from the grave (proving there is life in Heaven). Learn of Him and believe in Him . . . for He was the only one who has ever loved you enough to substitute Himself for you on the Cross. He suffered and died on the Cross to save you from the torments and darkness of Hell ... if you will accept it. That is why He is called Savior. If you sincerely believe these things and ask Yahwshua to come into your life and honestly try to stop doing those things Yhwh says are wrong, you will enter the Kingdom of heaven. The only unpardonable sin is to reject Yhwh's spirit, His love and His free offer of life in Heaven by rejecting Yhawhsua, who stepped forth from Heaven ... not to condemn the sinner, but to save the sinner (from destruction) and who willingly and lovingly shed His blood on the Cross so we can be washed clean of all of our sins. The Holy Scriptures also says there will be no peace in our lives until we make peace with Yah, through His Son, our Rabi Yawshua Ha Mashiah. The Bible also says there will be no peace on Earth until our Mashiah returns . . .
Bible prophecy foretells a 10-nation military alliance that will rise out of a revived Roman Empire (the European Union) and will come under the control of the Antichrist (Daniel 7:23-24). Unknown to many believers, a 10-nation military alliance appeared in Europe in 1995, called the Western European Union (or the Brussels Treaty Powers). These 10 nations are members of both NATO and the European Union. What bound them together was a mutual defense obligation under Article Five of the modified Brussels Treaty, which meant that an attack against one would be an attack against all. To learn why this alliance held interest to students of prophecy, read our Overview. Yet, on March 31, 2010, the 10 nations announced that they had agreed to terminate their alliance and transfer the Western European Union’s powers to the European Union — which, under the Lisbon Treaty, has developed a mutual defense obligation that includes all the EU member states. The Western European Union’s activities are scheduled to wrap up by June 2011. This chart is taken from the Western European Union Web site. 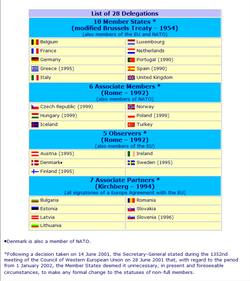 To see the chart, click the link under “Membership and Organization” titled “Delegations.” Note that only 10 nations are full members and have voting rights. Also note the footnote at the bottom of the chart, which says that the former WEU Secretary-General, Javier Solana, stated that the number of full members would not change for the foreseeable future.